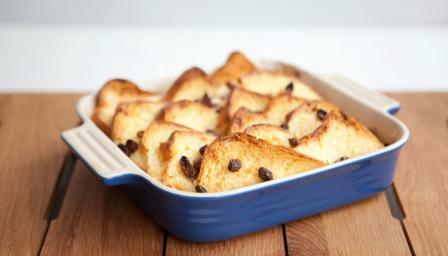 Beautiful crisp edges and a soft custardy middle - this is what every girl looks for in a bread and butter pudding. Mix the eggs, sugar, milk and vanilla extract together in a large bowl. Slice the bread of your choice, toast and butter it and arrange in overlapping slices in the bottom of an ovenproof dish, leaving some edges sticking out at the top so that they crisp up. Scatter the soaked raisins over the top and then pour in the egg mixture. Bake for 30 minutes in the preheated oven and serve warm with cream or custard.